The single's B-side was titled "Change the Man". The twelve-inch single featured an extended version of "New Song" together with "Change the Man" and the original studio version of "Conditioning", which would be re-recorded for Human's Lib. "New Song" itself was later re-recorded for The 12" Album, in a version denoted "New Version". This featured a lot of multi-layered piano, in contrast to the austere synthesizer sound of the original seven and twelve-inch versions. Equipment used for the song includes a Roland Juno-60 synthesizer, Moog Memorymoog synthesizer, and an EMU Drumulator drum machine. On the UK seven-inch single, the song's lyric is printed in a spiral on the A-side label, with all the credits printed on the B-side. DJ Mike Read refused to play "New Song", suggesting it was too similar to the song "Solsbury Hill" by Peter Gabriel. The video opens at a food processing plant, where Jones works as a caretaker. As the owner arrives on the site, Jones strips off his uniform overalls and begins to sing to the other workers. One of them, a man wearing black/white face paint removes his overalls and begins to dance through the plant. As the owner begins to mop the floor, Jones, the dancer, and several employees pile into his luxury car and drive off. Jones and the dancer next visit an Underground station (specifically Holborn Station) to perform for the patrons, then visit a window cleaner and get him to take a break from his work. Finally, the two arrive at a school and interrupt a class of unruly students, who follow them outside to play on the lawn, followed by their teacher. 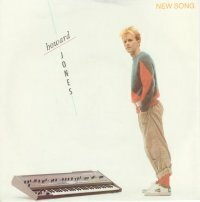 ^ "Howard Jones goes it alone, revealing how 'New Song' and other hits were created". 1 February 2018. ^ a b "Chart Stats – Howard Jones – New Song". Retrieved 8 August 2009. ^ a b "Howard Jones > Charts & Awards > Billboard Singles". allmusic. Retrieved 8 August 2009. ^ Easlea, Daryl. Without Frontiers: The Life & Music of Peter Gabriel. Omnibus Press. ^ Mime artist and regular live/video collaborator Jed Hoile. ^ Kent, David (1993). Australian Chart Book 1970–1992 (Illustrated ed.). St. Ives, N.S.W. : Australian Chart Book. p. 161. ISBN 0-646-11917-6. N.B. the Kent Report chart was licensed by ARIA between mid 1983 and 19 June 1988. ^ "irishcharts.ie search results". Retrieved 8 August 2009. ^ "swedishcharts.com – Howard Jones – New Song". Retrieved 8 August 2009. ^ "Howard Jones – New Song – hitparade.ch" (in German). Retrieved 8 August 2009. "Like to Get to Know You Well"
"No One Is to Blame"
"You Know I Love You... Don't You?"